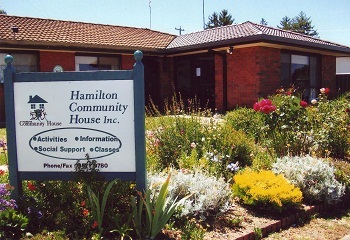 Welcome to Hamilton Community House Inc.
Neighbourhood Houses are local organisations that provide social, educational and recreational activities for their communities in a welcoming supportive environment. There are approximately 360 Neighbourhood Houses across Victoria with at least one Neighbourhood House in just about every town and suburb in Victoria. Neighbourhood Houses are managed by volunteer committees and paid staff. They offer many opportunities for volunteer participation in all aspects of the house activities and management. Activities are generally run at low or no cost to participants. Opening times for the House are 9.30am to 5pm Monday to Thursday. Shed hours are Monday, Tuesday, and Thursday, from 10am to 4pm. Please note, Co-ordinator employed hours will remain at 9.30 am to 4.30 pm Monday to Thursday. Commencing January 1st 2017, Child Safe Standards have been introduced by the Victorian Government. By endorsing these standards, it is mandatory that Hamilton Community House Inc. is compliant with all elements of the standards to ensure the safety of children in this organisation. Therefore, all staff, volunteeers, participants, tradespeople, students, people on work placements, and visitors must sign the day diary upon entering the building. The day diary is located on the right hand side of the top shelf immediately inside the brown solid entrance door, below the airconditioner. Children under the age of one year are able to accompany a parent or carer attending an organised activity session. If it is too disruptive to others, both may be requested to leave. Only children between 1-18 years are permitted to attend specifically arranged activities such as school holiday activities, youth events, work/student placements, or those events with a child focus and/or approved by HCH Inc. in accordance with the standards, policies and procedures. Do you have any suggestions for activities and classes? What would YOU like to do? Do you have particular skills you could share, for example computers, cooking, craft, and other hobbies you would like to explore or share with us? 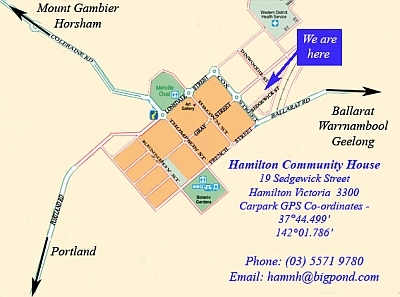 Visit the Contact Us page or ring Debra on 5571 9780. We'd love to hear from you, the more the merrier! Or catch up with the latest news and photos on our Facebook Page- click below, and please Like us! Click below to view and download the latest editions of Chin Wag, our House newsletter, and Chatterbox, our children's newsletter.